In tune with the times, I am addicted to computer Solitaire, and never do I double-click a King of Hearts to the top of its pile without thinking of a certain German shepherd.I cannot vouch for the absolute truth of King's story because I became part of it only in the last paragraphs. Yet I do know that the Italian farmers who told it believed with such fervor that I, already an admirer of this aged, but still noble, still handsome, dog, came to believe it, too. I can attest to his charisma because my two dachshunds, world travelers who thought themselves persons of rank, were not overly fond of dogs. Perhaps their own kind constituted a reminder that they were not all they dreamed themselves to be, but King won their respect--and their hearts--the first day they tumbled willy-nilly out of a taxi from the railroad depot and into his realm. His kingdom was a land of olive branches, grapevines, almond trees, sheep and chickens, chickens, chickens. Stiff after thirty-six hours of train travel through Europe to reach this paradise edging the Adriatic Sea, my Boston-bred doxies took one look upon arriving at the farmhouse and leapt to freedom through the taxi's open window into a swarm of hens and chicks that fled hysterically before them in waves. What a festival of feathers in flight! But my male gave new meaning to the term "foul play" when he swept up a skittering, downy chick in his powerful jaws and made for the house. He got no farther than the door when he came up against an immovable obstruction--a large German shepherd planted firmly on the sill. The dachshund skidded to a halt with the incriminating evidence, still alive and peep-peeping, dangling from his mouth. The larger dog literally loomed above him, head lowered, almost nose to nose. No gesture of menace other than a spellbinding, steady gaze held my dog in thrall, but there was no question who represented the more awesome force. In command of the situation, with the air of Solomon adjudicating at the Temple, the German shepherd lifted a massive paw and tapped the dachshund's muzzle--lightly, gently, only once--before the dazed but unhurt chick fell to the ground and tottered off. My male crouched in deference with his tail between his legs while his female companion, having been watchful of the proceedings, inched forward to hunch down beside him, both of them dribbling pee. Although old and infirm himself, King became my dogs' mentor in all things countrified. He delighted in hobbling after the younger pair, cheering them on with a bark in an exciting rabbit chase through the open fields, but he insisted they use self-restraint around the domestic coneys near the hutch. Rounding up sheep or goats truant from the herd was an essential, if playful, occupation, he assured them, but once those animals were under control, a good dog turned to rooting out gophers or napping in the olive grove. Also, well-behaved country dogs did not bark at the heels of ladies carrying burdens such as a basketful of laundry or a thirty-gallon milk can on top of their heads, but itinerant Gypsies entering the yard without permission were fair game, proved as they were to be thieves of garden tools or anything not nailed down. These imperatives the grand old prince somehow instilled in the dachshunds' brains. He paced them in other things, too: this is the way we stand in line to lick a broken egg off the marble floor, with you two behind me; this is where we store table scraps we're saving for later, yes, right here in the corner, and the big stack is mine; these are the sleeping areas at the hearth, and please remember the one closest to the fire belongs to me. King lay in his usual place at the fireplace one night, warming his old bones, when I heard for the first time his fascinating tale. 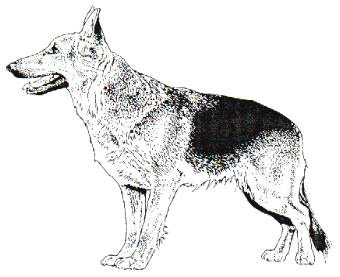 This German shepherd was not Italian by birth, but, true to the designation of his breed, was German-born. Whelped in troubled times, King was inducted into the German army along with his master a few months before the end of the Second World War. His owner had reached late middle age--too old for military service, but young enough to hold a gun. Nor was King a pup, being about three at the time. The dog responded to special training with intelligence and enthusiasm. He out-performed others in the field and attracted much attention from humankind. The Nazi commanding officer even proposed making King his personal dog, but neither his master nor he would hear of it, the master being bold enough to say no, and King stating it in his own way by means of a determined stance at his master's knees and a steely glint in his eye when the commander came too near. "That dog has great potential as a killer," the officer was heard to observe as he turned away, which was a high compliment under the circumstances of his command. "I have decided where these two will be placed." Unperceived when his decision was made were the gentle hearts of a lonely man and his loving dog, two kind souls he proceeded to assign one of the most heinous tasks in the history of the world--guarding victims of Nazi aggression imprisoned in a concentration camp before transport to the installations exclusively devoted to the murder of innocent people. Mixed in with Poles, Gypsies, Jews, and other civilians detained at the camp which King and his master were sent to help guard, was a small number of Italian conscripts held as prisoners-of-war. These men felt especially betrayed, having been told, when Mussolini fled Rome in 1943 after the Americans invaded in the south, that they would be repatriated to help Il Duce regroup in the north. Yet here they lingered in early 1945, starving with the rest. It was these whom King and his master oversaw. Among this bitter lot were two, a younger and an older man, from the same part of Italy, that paradise of mine beside the Adriatic Sea. The younger lived only to return and marry the lady he loved, in whose home I would be a guest some sixteen years later. He talked incessantly about her, describing to his friend the beauties of her person and the glories of her table, for she was the best cook, he swore, between the Mountain of Flowers and the sea. Memories of her meals became the dreams on which he survived. God knew there was little enough real food to eat. Formerly husky, and admired by fellow farmers for his robust appetite, he had shrunken to a spectral shadow. Infinitely better housed and fed than their wards, King and his master maintained a requisite distance, but watching people starved, and ill-treated besides, became repugnant to the master, as it would to any decent human being. A change came about one morning, however, when Mauro, the younger of the two Italians, staggered out of his freezing, broken-windowed barracks, driven by hunger to an act for which he could have been shot. He wove across the compound toward the heated guard shed where King and his master stood, and fell, semi-conscious, in a scraggly, bone-jutting heap inside the painted perimeter where an inmate was forbidden to be. The doorway of the shack stood ajar. King nosed his way out. With delicate steps, he moved cautiously toward the prisoner, casting a backward glance from time to time toward his master, who remained motionless with a rifle warily at rest in his hands. The dog's wet nose touched the Italian's cheek. Mauro opened his eyes and said weakly in German: "Feed me, or shoot me. It's your choice." The Italian could not see the look of compassion that spread across the German's face. Reaching behind him to a table, the guard dropped a hunk of nourishing black bread to the floor. "Fetch, King!" he commanded softly. King raised his head and saw the bread. Returning to the shed, he took the morsel gently between his jaws. He looked at his master and read the next command in the eyes and the nod of the head. The dog dropped the bread at Mauro's hand. The Italian, savvy even in his extremity to the need for this gesture of kindness to remain unseen by other guards, furtively tucked the bread into his ragged sleeve and crawled away to share the booty only with his friend. Neither would dare tell their fellow prisoners-of-war. The envy generated could cost them, and the guard, their lives. During the next weeks, sharing the German's rations gave birth to a sense of kinship among the three men and the dog. They even managed brief conversations. King developed the habit of hiding bits of food for his Italians at the back of a crawl space beneath the barracks. This was perhaps the origin of the lessons he would give my dogs later on the storing of extra food. The war was moving quickly to an end. Daily rumors of Russian advances sent ripples of panic through the Nazis on duty in the camp. A day finally came when orders were issued to transport the inmates deeper into Germany, including the Italian prisoners. Hearing the news, and sensing that doom for his unfortunate friends might be at hand, King's master decided, with boundless compassion and more courage than that found in ordinary men, to somehow contrive their escape. Choosing the moment of general assembly in the main yard as the transport trucks roared into camp, he motioned the two men to follow and led them, with reckless disregard for himself, to a temporarily unsupervised area where he proceeded to cut the fence. No sooner had the Italians got through and into the woods than machine-gun fire and a terrifying cacophony of shouts announced discovery of the escape. Despite their dangerously weakened condition, the Italians ran on till nightfall, constantly in mortal fear of pursuit and capture, when they finally dropped in a thicket of trees and passed out from utter fatigue. They were awakened by the crackle of twigs as someone bounded toward them through the forest. Thinking the end had come, they rose up to meet death like heroes, but were instead confronted by none other than King! They both embraced him, crying and laughing in relief. He lapped their faces. He had found his dear friends. The Italians looked over his shoulders, hoping his master might also appear. Then they settled back and took stock of what they saw. Their hands, their faces, every part of them that had touched the dog, were smeared with copious quantities of drying, caking blood. The men examined King from head to toe. He bore no wounds. They looked at each other, and wept. This time there was no relief, or joy, in their crying. This would be the blood of King's master, shot down when other guards saw him at the fence and realized what he had done. It would have been like King to try to rouse him, to tug him to safety if need be, but a dog with such intelligence would quickly understand that his master was beyond help. In an instant of decision, with bullets flying, the German shepherd had made himself a fugitive, too, doubtless turning away from the Italians at first to throw any pursuers off the scent. The three of them headed south, hoping to pass through any front lines without encountering troops. As Italians, one-time members of the Axis powers, and themselves active in Mussolini's Black Shirts, they concluded they would be treated badly by any of the Allies who captured them and checked the records. They resolved to keep to themselves all the way home. King remained a constant companion, often more useful in gathering food than they. He herded the random cow or goat for fresh milk, and waited patiently for his share when he brought in a squirrel or a rabbit. Still, the diet was spare, and sometimes the meat had to be eaten raw. Mauro never rallied. He grew weaker by the day until the older man begged him to go into a village or a town to seek medicine and proper food. In their stark isolation from civilization over a period of many weeks, they did not know that the war was over. They could have found safe haven anywhere. "No, my girl will cook for me at home," he said. "I will wait. We will be there any day." But his mind began to wander, and "any day" became "tomorrow," then "yes, we'll be home for mezzogiorno"--the midday meal. "Oh, look, do you see the smoke from the chimney? The food is on the fire! Hurry! Hurry! She is waiting!" It was in this mental state, one rainy morning in the Dolomites, a range of rugged mountains between Austria and Italy, that Mauro sat down and fell back against a rock, repeatedly pronouncing his lady's name. Gathering him into his arms, the older man called King back from running ahead. As if sensing what was to come, the dog nuzzled Mauro's gaunt cheeks and gazed lovingly into his dark-circled, deep-sunken eyes. Mauro's last words were addressed to the dog: "King, you'll love her as I do. We will always be together. You'll see!" The wretched young man died that day at the age of 27, but he had seen clearly into the future before he went. King did indeed love the lady Mauro would have married, from the moment a month later when he set foot at last in her homey kitchen and found that everything his friend had said about her, and her cooking, was true. King stayed with her to the end of his life. I came to King's farm with my dachshunds during the German shepherd's last few weeks on earth. He became increasingly infirm while we were there and took to sleeping downstairs near the outer door so he could stumble outside when the need arose. There being no modern conveniences in the house, such as electricity, running water, or central heating, a charcoal brazier was kept nearby, aglow with hot embers, to provide him with warmth where he lay. My dogs made a nuisance of themselves, cajoling him to play, but he never raised his voice or turned them aside. I had been teaching English to kids around the countryside. My Italian was atrocious, but the mere fact that I kept on trying gave everyone the courage to keep practicing their English as well. In early February, I began injecting a talk in my classes about Valentine's Day, a holiday unknown to them. I promised to make some sample cards to use as models in crafting their own, which I did one afternoon sitting near King. I gave the lady of the house my little lecture about hearts entwined, and so forth, while I cut-and-pasted simple valentines. She seemed quite interested, listening intently while she knelt beside King's basket, stroking his chest. After I had done talking, she told me her own version of King's story, which was more richly detailed than any I had heard from others who related it to me. It was as if she herself had suffered with Mauro in the prison camp, had hungered and thirsted at his side and had walked the long walk through Europe with King leading the way over remote mountain passes, along cliffsides, through forests, always in terror of discovery. She claimed she did not regret her choice not to marry. It had allowed her to care for her aging parents, she said, "as a good child should," although I perceived her unattached state to be more a memorial to Mauro and the love they shared. Busy with my valentines, I became aware after awhile that she was not talking anymore. I looked over and saw her soundlessly weeping. King's head rested in her hands. When I looked down at him, my tears, too, began to flow. Quietly, softly, our King had slipped away. Covering him with her shawl, without a word she pulled his basket into the room where the wine from her vineyards was aged in huge vats. She closed the door and remained there with him all night. Their only company was my dachshunds, who lay outside the doorway in silent vigil. King was buried in the afternoon in the nearest olive grove. After a couple of local boys lowered his body into the shallow grave, the woman of the house knelt to place a heart-shaped piece of red paper beside him. On it was written Mauro's name. We watched them cover him over before beginning the sad walk home. I looked back once as we left the grove, half expecting to see a German shepherd on the wing toward heaven, bound to deliver his valentine message of everlasting love.